Yesterday marked my first "race" of 2017 (I use the term loosely, as I have one speed - S.L.O.W.). If I am remembering correctly, it has been over a year since my last race, the Hamilton Hangover, a five mile run that takes place New Year's Day. I was woefully underprepared unprepared for yesterday's four miler. 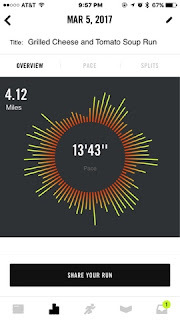 Since the start of the year I have added a mere 15 miles to my running shoes, no where near the amount of training miles I SHOULD have logged in preparation for the race. 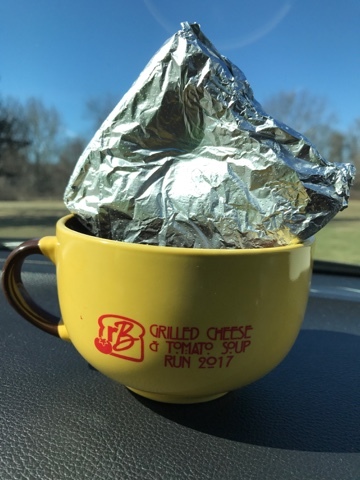 So, as I reluctantly got out of my toasty car yesterday to get my race bib, slightly underdressed for the frigid temps (thank goodness for spare gloves in my center console) I debated the merits of running a race in freezing temps. It was not only a debate with myself, but a debate with my best running friend, who is even less of a cold weather fan than I am. In the end, after heading back to the warm car to don our bibs and debate some more, we decided to tough it out and go for it. Why am I writing about this? Because I think sometimes we let fear paralyze us, keeping us from trying new things! Think about the number of times we don't try things in our classrooms or in our careers because it's new and unknown and we don't have all of the details. Or, even worse, our fear of knowing less about the "new thing" than our students keeps us from letting them explore and teach us something new. I see this all the time in my position (though I am happy to say that I am seeing it less and less); teachers give in to their fears of new technology and refuse to use a new tool until they know the ins and outs of the resource they plan to use and share with their students. They MUST be the expert before they will even consider introducing the tool. With the influx of tech tools in today's classrooms and the speed in which they morph and change, it is impossible to know everything about everything (or even one thing). Let your students be self-directed in their learning, deciding what they want and need to know about the new tool. Create a shared Google Doc that allows students to post technical questions and have them answered by their classmates. Release some of the control. You will be amazed by what you and your students can learn together. Yesterday I felt like a first time runner and my results were about the same, too. I had some of the same fears I had years ago at my first 5K and my goal was exactly the same-don't finish last. I challenge you to let go and just do it. Let yourself feel like a first year teacher for a single lesson, embrace your fears and set a new goal-to learn a new tool with your students. I assure you, the journey will be worth it! And the next time you try something new, you will know you can do it...because you already did.